Make a lifesaving blood donation on Feb. 7. One donation can save up to three lives. 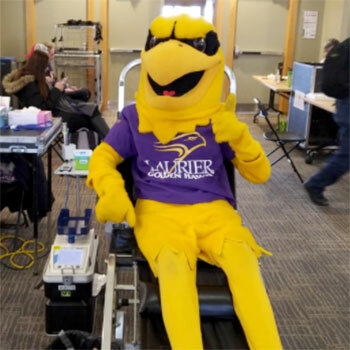 Mark your calendar for the Laurier Stem Cell Club’s bi-annual blood donation clinic, taking place Feb. 7 from 11 a.m. until 3 p.m. in the Senate and Board Chamber on Wilfrid Laurier University’s Waterloo campus. Walk-ins are welcome. If you would like to schedule an appointment, sign up in the Concourse from 11 a.m. to 2 p.m. on Jan. 28, 29 or Feb. 6. You can also schedule an appointment by emailing Melanie Cabrera at cabr2010@mylaurier.ca. In 2018, Laurier alumni, students, faculty, staff and friends came together to achieve our annual commitment to Canadian Blood Services. We pledged 350 donations and achieved 433! Let’s continue our commitment in 2019. It only takes about one hour to donate.